Anthony Vitti is an associate professor of bass at the Berklee College of Music where he graduated with honors and a degree in Music Production and Engineering in 1986. After obtaining his degree from Berklee, Vitti went on to pursue a masters degree in jazz performance from the University of Lowell and then later returned to Berklee where he has been teaching within the bass department since 1989. Along with maintaining a roster of private lessons at Berklee, Vitti leads bass labs in contemporary styles of playing. 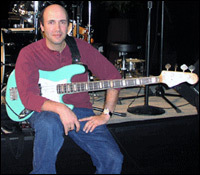 In 1995, Vitti founded his own publishing company, DaaDoo Music, and has authored some of the most advanced publications for bass players found anywhere today specializing in topics such as slap bass, fingerstyle funk, and sight reading. Besides his achievements as an instructor, Vitti has released two recording projects with drummer Larry Finn and performed with a long list of highly-regarded artists over the years such as Herb Reed and the Original Platters, John Scofield, Steve Smith, and Gregg Bissonette to name a few. In this interview, Vitti talks about establishing his own publishing company, his instructional books and videos, getting high-profile gigs, preparing to attend Berklee, the importance of being able to read standard notation, Fender Jazz basses, and much more. How did you first become involved with music and playing bass? I had some older brothers that played a little guitar but nothing serious. I wanted to play cello in the 6th grade, but my parents would not pay for lessons. In 1980 when I was 16, I got my first real job, and with my first $300 paycheck, I bought a 1976 blonde Rickenbacker 4001 bass. Most of my friends played guitar so I thought playing bass would be the quickest way to get into bands, and I was right! Who are some of the bass players that you found to be inspiring in your own studies as a student? When I first started, I was influenced by all the great rock bassists of that era such as Chris Squire, Geddy Lee, Stanley Clarke, and I also liked Paul McCartney. By the time I arrived at college, I was more into R&B and jazz players including Ray Brown, Louis Johnson, Robin Duhe, James Jamerson, Pops Popswell, Jimmy Haslip, Nathan East, Jeff Berlin, Jaco, and of course Marcus Miller. Which areas of bass playing did you focus on early in your development? Before I attended Berklee, I devoted all of my practicing to studying technique and time. I was totally self-taught until I got to Berklee. I would just sit for hours and try to mimic popular basslines exactly as they were recorded without making mistakes. What was your primary objective when you formed your own publishing company, DaaDoo Music, in 1995? In 1995, there were very few offerings in the bass book world. There were only a few titles, and they were all beginner method books. There wasn't anything challenging for me so I would buy trombone duets to practice sight reading. I wanted a difficult sight reading book to work on R&B rhythms. I eventually wrote stuff for me to practice that was not repetitive so I could not memorize the rhythms. This material eventually became my first book, Sight Reading Funk Rhythms. I thought there was a need to put out challenging material for people who could already play the instrument pretty well. Can you tell us a little about your books and videos? The videos are completely separate from the books. Rittor Music in Japan had a say in what content I could put on the videos. They lean towards the young, beginning player, but I was able to put a little bit of challenging material on them. With my books that I release through DaaDoo Music, I can put anything I want in them. Of all your instructional materials, which ones have proven to be the most popular? My best-selling book has always been my first, Sight Reading Funk Rhythms. 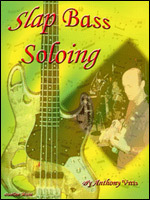 Although, my new book, Slap Bass Soloing, is selling like crazy, and by the end of this year, it will be my top-selling book. The Slap Bass Bible remains very popular, and the Finger Funk Workbooks Vol. 1 & 2 have sold very well, too. I also have the Hip-Hop Bass Grooves book which is one of my personal favorites. Are there any plans for more instructional books? Oh yes. I am recording a new DVD for Rittor Music and Hal Leonard at the end of this month. This DVD will feature Larry Finn and me just doing rhythm section stuff. There will be a drum version as well as a bass version. Hal Leonard will also be releasing my second DVD, Accelerate Your Bass Playing Vol. 2, in September. It has only been available in Japan since it was released several years ago. After this project, I will start on a new book. It will be a new sight reading book, and it will focus on odd time signatures and reading in difficult keys. I have had many requests for a new sight reading book, and there will be nothing like it available. Can you tell us about the recordings you've been featured on with drummer Larry Finn? We have done a few of our own recordings, but we have also worked together on many projects over the years. People tend to like certain rhythm sections, and Larry and I have the same concept of time and groove. We work very well together, and I think we really compliment each other. He is as good as any drummer I have ever played with, and playing alongside him is just so effortless. How did the opportunity to play with Herb Reed and the Original Platters come about? I got called at the last minute to sub for them back in 2000. I read the show down, and they offered me all the touring gigs. Today, I'm not doing as much as I used to with them because I'm really getting tired of the traveling and being away from my family. Which classes do you teach at Berklee? At Berklee, I only teach classes that I have personally written. They consist of Slap Bass 1, Slap Bass 2, Fingerstyle R&B, and The Evolution of Hip-Hop. Other than those four labs, I teach all private lessons. As an instructor at Berklee, which houses one of the largest bass departments in the world, do you tend to find common weaknesses amongst incoming freshman? Definitely. The most common weaknesses in students are almost always fundamentals including reading, time, feel, consistency, and getting them to hear what is important when playing bass. Students have to develop priorities on the instrument because they all tend to focus too much on what to play and not how to play. What do you think is special about Berklee that sets it apart from other music schools? Berklee is a fantastic place. There is no other school like it. I think the unique thing about it is the diversity of styles and the quality of players in the bass department. I mean if you want to study Latin music, you have Oscar Stagnaro who is one of the best Latin players in the world. You can study jazz with Whit Browne or Bruce Gertz, jazz fusion with Matt Garrison, and 6-string bass with Joe Santerre. I mean there is a lot of talent there, and the department chair, Rich Appleman, does a great job of assembling instructors who specialize in different styles. I can't believe who I am surrounded by sometimes. It's an honor to be one of the teachers there. After seeing thousands of bassists pass through the doors of Berklee over the years, do you have any tips as to how an aspiring bassist could go about landing a gig with a high-profile artist? You have to get it all together. You have to be ready for all aspects of gigging. That means being proficient in all styles of music. You need to be able to read really well. You should be able to sing, and that might be the difference between you getting a touring pop gig and not getting it. I have many students out with major artists right now. One of my former students, Chris Loftlen, is the musical director and bass player with Brian McKnight. Another student, Annie Clements, is on tour with the new country band Sugarland, and a big reason she got that gig is because she sings. If you were to give advice to a high school student interested in attending Berklee, which areas of study would you recommend they emphasize in their preparation before arriving? Your ratings and overall standing within Berklee are based entirely upon your ability to play jazz music. I don't care what the college may tell you about funk, rock, fusion, or any other style. It all comes back to your ability to play jazz. Get your walking together and learn all the standards. How significant do you feel it is for bassists to learn how to read standard notation and play from charts? That is what it's all about. If you're a serious musician, you need to read music. If you can't read, you have just eliminated yourself from ever playing Broadway shows, theater gigs, cruise ships, and a lot of session work. That's a lot of work that you don't qualify for. You want to maximize your ability to work, not minimize it. The more you are capable of doing, the more you will be able to choose what you want to do. Forget about tablature. It's a waste of time. No serious bassist reads that stuff, and I have never been presented with it on a gig. Can you describe your approach to developing grooves and improvising solos? That's hard to describe. I definitely take a more rhythmic approach to developing lines. I try to think in terms of four or eight-bar phrases and not one or two-bar grooves. I consider myself a rhythm section player because soloing has never been my focus. I like supporting singers and soloists, but that is not to say that I don't like soloing. I certainly enjoy a tasteless display of chops and technique as much as the next guy, but I have made my living as a rhythm section player. With all of your music-related endeavors, do you ever get burned out and if so, what helps energize your playing? My fellow teachers keep me energized. I always feel like I have to keep up. There is a lot of talent in Berklee's bass department. I try to offer playing that is current and unique. I also try to offer original materials that the students can't get anywhere else. Students pay a lot of money to go there, and I feel like I owe it to them. I think we all get a little burned out now and then. I just stay really busy, and I always have something going on. What do you like most about traditional instruments such as Fender Jazz basses? I use Fender Jazz basses exclusively due to their sound and feel. There is nothing else out there like them. Other basses may be better for a particular style, but a good Jazz bass sounds good for all styles. How do you prefer to record your basses? I plug directly into the board with some compression and that's it. The bass has to sound good on its own.